The summer residents on North Haven Island recognized that over in Bartlett’s Harbor there was a bohemian colony of artists. The two groups didn’t socialize much together, the artists being absorbed in their work and isolating themselves to allow their creative juices to flow. Of the artists who lived in the colony or visited there, there were four who were considered outstanding. Three were men and one was a woman. The first of the men was Frank Weston Benson (1862-1951), the highly acclaimed and popular painter of impressionistic scenes and the sporting life, part of the famous Boston School of painters teaching at the Museum School. Bela L. Pratt (1867-1917) was a sculptor who had been taught and mentored by the most famous of American sculptors, Augustus St. Gaudens, a versatile sculptor from monumental size work to tiny coins, and head of the Department of Modeling at the School of the Museum of Fine Arts. 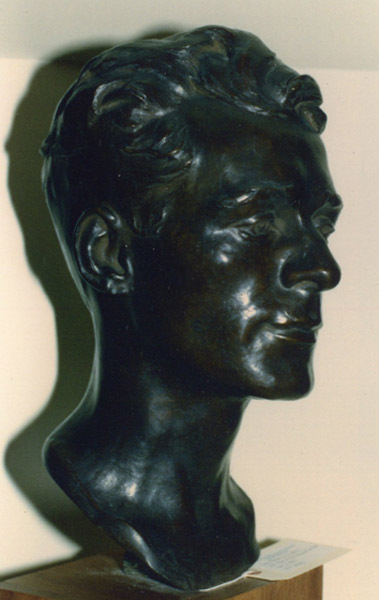 Frederick Warren Allen (1888-1961) was the third, a very fine sculptor in his own style who had been mentored and befriended by Pratt and who took over his position not long after his teacher’s death. The woman was, even at that time, a very fine portrait and landscape painter by the name of Beatrice Whitney Van Ness (1888-1981). The same age as Fred Allen, she was a student of Frank Benson and also went on to teach at the Museum School. Her work is presently highly regarded and valuable. All four maintained studios on North Haven’s Bartlett’s Harbor in the summers. Carl Van Ness was Beatrice’s husband and the couple lived just around the bend in the harbor from the Allens on the other side from Bela Pratt’s home. The North Haven Artists Colony had a life of it’s own and everyone participated in clambakes and work parties. In getting to know the Van Ness family, the children would play together and the parents would socialize and participate in work projects together. Carl was a handsome man and Fred was always looking for good subjects to sculpt, so the couples arranged a swap, one of Beatrices’s paintings for a portrait bust. The near-life-size portrait of Carl is a thrilling piece of sculpture, modeled in clay and cast in bronze with a dark patina, it is mounted on a driftwood block. The hair is windswept and the face calm and thoughtful with a hint of a smile. His eyes gaze out before him as if watching the water for his daughters in their sailboat or dreaming of a pleasant encounter. His strong features are confidently modeled, the volume of his intelligent head balanced on the center axis over the neck, and smoothly realistic skin contrasting pleasantly to the textured portions of the portrait. He feels alive. A different style from direct carving in wood or stone, Allen shows his gift here for obtaining likenesses in another medium and his great skill in modeling with clay. Here again in this bust are his teaching principles epitomized, a strong center accented and enriched by the subtlety of smaller forms. Carl Norwood Van Ness is presently owned by the Farnsworth Museum in Rockland, Maine, a gift of Beatrice’s daughters Mary and Sylvia. His granddaughters still come to the Bartlett’s Harbor summer home.